Sometime back, I believe when I posted 'Bread Baking Basics', someone asked me to give a basic bread recipe. 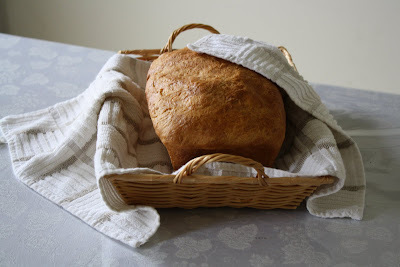 I have many bread recipes here on this blog, but they all have some additional twists. 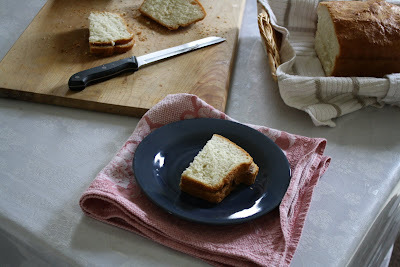 I am giving a basic white bread recipe which can be made with ingredients that almost everyone can find. For the first time in 5 years (since I got the bread machine), I made bread by hand today. In a large bowl, combine warm water, milk, sugar and yeast. Let it sit for about 10 minutes or till frothy. Now add the salt, oil. Mix well. Slowly start adding flour to make a smooth dough. Now comes the fun part or hard work part. Knead the heck out of this dough for about 10 minutes. If you are mad at someone, this is the best way to calm yourself down. Yes, it works every time for me. Coat with oil, cover with a clean kitchen towel and let it rest for about an hour or till double in volume. After the initial rise, deflate the dough gently and on a lightly floured surface, shape into the loaf. Grease a 9 X 5 pan with vegetable oil spray and place the shaped dough in it. Cover loosely with an oiled aluminum foil and place in a warm place till double about 45 minutes to an hour. Towards the end of the final rise, preheat the oven to 375 F. When ready to bake, place the pan in the oven and bake for 20 minutes. Lower the temperature to 325 F and bake for another 15 - 20 minutes or till the crust is nicely brown and bottom sounds hollow when tapped. If you feel it is browning too fast, cover loosely with an aluminum foil and then bake. (Do this after the first 20 minutes of baking) Cool on wire rack. You could brush with some milk or milk and oil mixture before baking to get a nice color. When still warm, brush with butter to get a softer crust. You could use the same recipe for making Wheat bread. Use wheat flour and you will have to knead it for 20 minutes. You can knead it less and get a good bread if you use vital wheat gluten. You might have to use 2 - 3 TBSP of flour less since wheat flour takes more fluid than white flour. 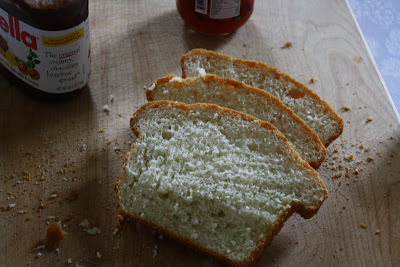 I will post the 'Honey Whole Wheat Bread' recipe soon. I am sending this bread to Susan's 'Yeastspotting'. 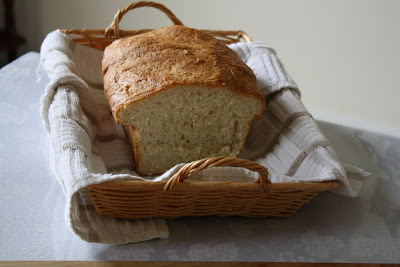 Thank you for sharing the recipe for basice white bread.Bread looks nice and soft. Yes, you may use it but you will have to knead it a little longer and might have to use less flour since chapathi flour is whole wheat flour or at least a blend of white and wheat flour. homemade always the best...Bread luks very soft,perfect. Fantastic Champa!! Thanks a lot! Will surely try this out.. Hope adding things like chopped onion will not affect the bread? Nothing will beat home made bread, looks gorgeous.. Thanks all for leaving a comment. If you want to make khara bread or masala bread, leave out the milk. Use just water and use only about 3/4 cups. After you add chopped preferably sauteed onions, you might have to add some more flour to get the right consistency since the water in the onions might make the dough mushy. When you start with 3/4 cup of water, don't add all of the flour. Use how much ever is needed since when you add more flour at the end, it'll balance out. Hope this helps. Simple and easy to make. Will definitely make this once I am out of 50-ingredient store bought bread ;). Thank you Champa. Not a big fan of white bread, but I have to say they look perfect..just like the ones on store shelves! Lovely recipe dear. Love how soft it has come. I am thinking of venturing into breadmaking..
Wow!nice breads..think I should try my hands on this..I don't bake much..still think I should try this..
Champa, I'm conducting an event for June-July. Try to send in your entries. Do we need to bake covered with foil. and what is the conversion in Centigrade. I have a rectangular bread mould. How much the dough has to cover it. A rectangular loaf pan can be of the size 9" X 5" in that case, this recipe works fine in that. It can also be 8" X 4" in that case, the dough might be too much for the pan. Hope that helps. Looking forward to your bread. Will plan to bake this week. and let you know the outcome! Any bread machine is fine. Go through my post on bread machine - do I need it? You will get a better picture. I do not know if you do not like to go to thrift stores, but you can get brand new still in box or hardly used bread machines for under 20 bucks. Mine was a gift but if it gets broke, I am going to buy it from the thrift store and not pay full price. This was the first time me baking bread and it turned out brilliant thanks to your easy to understand step by step instructions. Thank you so much for this wonderful recipe. Thanks for the feedback. I am glad you liked it. Hi Champa, you have a whole load of breads here and I am glad I spotted your blog. I have been hopping into Suma's blog for a while and got to know of your work in through. In this recipe, you mentioned that All purpose flour can be replaced with whole wheat flour and Vital Wheat gluten if kneading for a shorter duration. Could you tell how much of wheat gluten is to be used per cup of wheat flour or any other calculation? Right now my oven is baking the 'whole wheat bread' from your recipe list. Not sure I came across this pointer in that recipe. Keeping my fingers crossed to see how my bread is going to turn up. You can use 1 TBSP of vital wheat gluten for every cup of whole wheat flour. You might have to increase the water by few TBSP to get the right consistency since whole wheat absorbs more water than all purpose flour. Champa, thanks so much for your quick reply. Yesterday's bread baked OK, it din't rise much. I am planning to bake this today again and will use the wheat gluten.